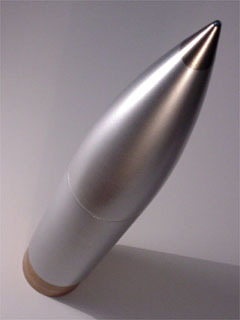 The nose cone and payload section of the SkyPirate used Dupli-Color Ultra Silver and Pewter. Masking nose cones is a really tricky challenge. It starts by making sure the primer has a rough enough surface to cling to. If this step isn't right, there's little hope for success. I use 3M Plastic tape to mask nose cone tips. 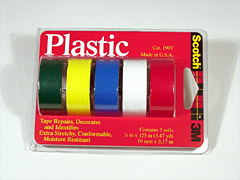 The tape is more like a stretchy, flexible vinyl and will conform to just about any shape. It can really hug a surface and provide an excellent seal. It helps to narrow the width of the tape to about a quarter of an inch. I do the rest of the masking with traditional blue masking tape, paper and aluminum foil. Recently,l I've switched to using a commercial masking paper. The technique for removing the tape is just as important. Let the paint dry completely. Do not pull the tape off perpendicular to the surface of the paint. Try to pull the tape off 180 degrees opposite of way it was applied. I found 3M Plastic tape to be great for masking nose cones. 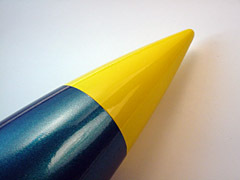 Close up of the nose cone. 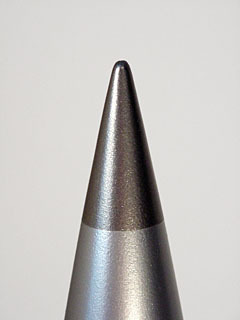 The tip is about 1 1/2 inches long. The thin seam has more to do with the paint than the tape.No effort has been made to smooth the seam. 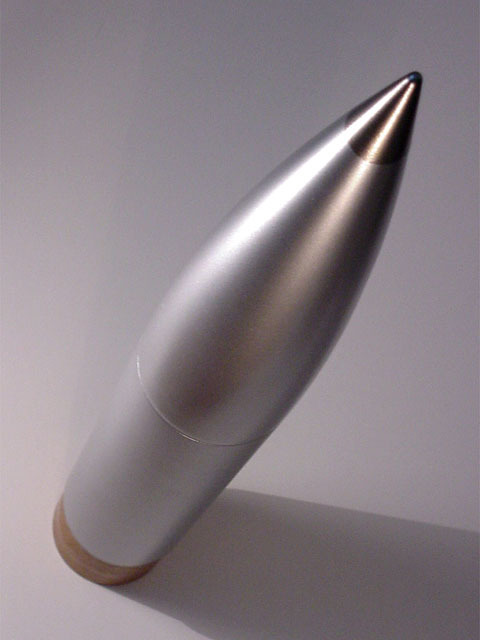 Nose cone of my Estes Big Daddy.